Running for Office? Candidate products here! — Graphicsource Inc.
Yard signs help build name recognition for candidates as well as build campaign momentum. Our yard signs are double-sided and made of corrugated plastic (Coroplast), which is a tough yet lightweight material. The signs come with H-shaped wire "stands" for easy installation. So don't wait, orders your today! You'll need some handouts for events. Postcards are great for this because you can use some for handouts and address and mail others. 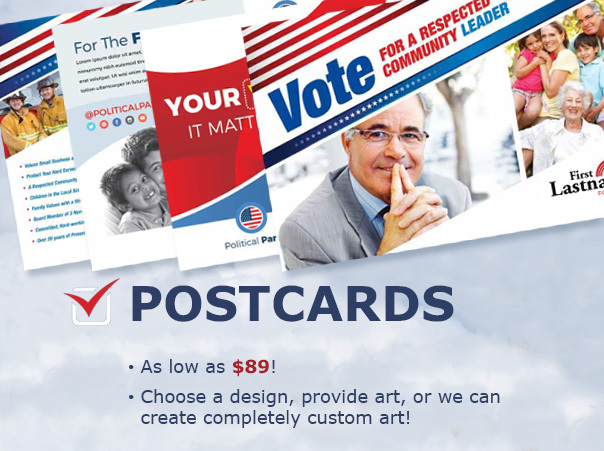 Print custom Postcards and send them via Direct Mailing or USPS Every Door Direct Mail. Target specific zip codes and up to 5,000 voters a day. Make your campaign ads stand out in high-traffic areas with full-color custom Banners. Set up is a breeze with grommets or a retractable stand. I would like to order a banner! 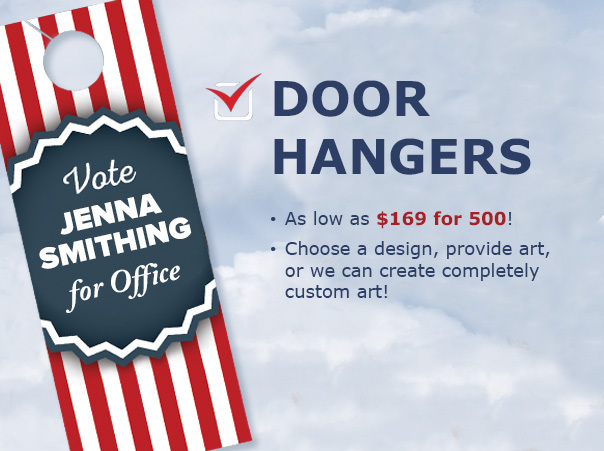 Door hangers are an easy to carry and a great way to deliver your candidates political message. Great idea! I'd like some!